"Jayne and I first met Sharon 23 years ago, when similarly to most skaters we were visiting the physiotherapist with general injury's and I was in my usual state of disrepair. We've both seen many physiotherapists over the years but the moment Sharon treated us we both knew at once that this lady was someone very special and someone who knew her profession inside and out. Jayne and I also knew that we wanted her around as our physio whenever we were performing. Sharon's knowledge of physiotherapy is unmatched, with not only an extensive understanding of traditional physiotherapy but also she understands all the latest cutting edge treatments too. When in the past, myself, Jayne and other professional skaters have looked like our injuries would prevent us from performing, Sharon has managed to treat and mend us so that the show could go on. 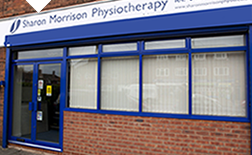 We trust Sharon implicitly with all physio advice and treatment she provides." "I have had the pleasure of knowing and receiving treatment from Sharon for over nineteen years now. During that time she has attended to a multitude of injuries that I have sustained throughout the course of my dance career. From simple maintenance to potentially career ending injuries, Sharon has been a saviour for picking up the pieces, putting me back together and enabling me to return to the stage. On one recent occasion I awoke with excruciating back pain and was unable to stand up straight. I was performing the lead in the ballet 'Beauty and the Beast' that very evening and I feared the worst. Within a matter of minutes Sharon had worked her magic, giving me the confidence to not only make the show, but to perform at the highest level. Her 'no nonsense' approach, unparalleled experience along with a great sense of humour are a perfect combination to inspire total confidence. Also, her uncanny ability to instantly diagnose the injury and replicate the symptoms have led me suspect that she is gifted with x-ray vision! I cannot recommend her highly enough!" "I met Sharon eleven years ago at the beginning of my Dancing On Ice journey and I don't know what the team would have done without her. Since then I have skated with Linda Lusardi, Emily Symons, Roxanne Pallett, Kerry Katona, Jennifer Ellison and have won the show three times, first time with Gaynor Faye and second time with Hayley Tamaddon and finally with Beth Tweddle. Sharon has always been there for me, treating any injury I have had, putting me back together after every bump, bruise, strain and pull. I had recently torn my hamstring during my rehearsals, one week before my latest celeb partner, Jennifer Ellison and I were due to perform. Sharon gave me fantastic treatment and support and had me back in action ready for my first show. Thank you Sharon for being a fantastic physio and friend! X"
"Throughout my professional career Sharon has treated my many injuries, lots of small niggles and a potentially career ending knee injury. Not only does she get me back fit and healthy and doing what I love, she manages to get me back stronger than before. Her straight talking approach is what I like, there is no messing about with Sharon and that's why as soon as I feel an injury starting the first number I look for is Sharon's. For me she is easily the best in the business." "My husband Bob and I cannot speak too highly of the care that we have both received at this clinic. Sharon quickly sorted out a frozen shoulder that Bob suffered with a few years ago and Maxine and Sharon have achieved quite staggering results in the last few months with problems I developed in both of my shoulders as an indirect result of MS.
Max worked with me in a way that pushed me to achieve what needed to be done while understanding and allowing for the basic problems caused by the MS.
Bob and I are intensely grateful to both Sharon and Maxine and do not hesitate to recommend them to others. It goes without saying that we would not use any other clinic." "I am delighted to have the opportunity to recommend this physiotherapy practice. A series of orthopaedic operations on knees and ankles had left me increasingly crippled at the age of 50 and facing the prospect of further surgery with no certain outcome. I was very unhappy indeed when, blessedly, I fell into the capable hands of Sharon and Maxine. Their professionalism, care, kindness and complimentary skills have restored me to much better health and the prospect - if not of Himalayan treks - at least a normal life, hearty walks around the park and no appointments with the scalpel any time soon. Given that a year ago I could hardly limp around Marks & Spencer, this feels little short of miraculous! If you need physiotherapy, it is my belief that you could not come to a better place. I, for one, am extremely glad I did." "I am a 90 year old lady who has been suffering backache for almost 9 months, relying on pain killers for relief. My friend introduced me to Maxine who then sent me for an MRI scan. She made a diagnosis and referred me to the right consultant. Wonderful to be pain free. Bless you Maxine." "I first met Maxine approximately 25 years ago who treated me for acute back pain. I have consulted her numerous times since and she has never failed to make me comfortable and get me mobile. Always sympathetic, cheerful and extremely professional. Thank you very much." "We saw Maxine, on a Wednesday, back in October 2012 for what I thought was growing pains or slight discomfort with my 12 year old daughters hip. At our initial consultation Maxine was extremely thorough with my Daughter, very reassuring and friendly with her but very professional and urgent in what turned out to be a spot on diagnosis of a more serious hip growth plate fracture. Maxine was calm and efficient in determining our immediate steps to get x-ray to confirm her diagnosis. Over that weekend, although we had only met Maxine once, she was constantly in touch, pushing for results from X-Ray, advising us on how best to lessen any worsening of my daughters condition and speaking to consultant specialists of her condition. Maxine was one step ahead of us and thanks to her we were seen on the following Monday night by a specialist hip surgeon and she was admitted to hospital on Tuesday for surgery. Ironically the day the doc called to advise us to make an appointment to discuss her x-ray! After surgery we were in no doubt who we wanted to rehabilitate Maddie and from Christmas 2012, once she could weight-bear, we began a steady series of sessions with Maxine. My daughter would push herself and completed her physio daily, she has total trust in Maxine and because of this confidence Maxine has given my daughter she went back to playing county netball at the beginning of March 2013. I just cannot praise Maxine enough and as parents of sporty kids am constantly telling everyone what a great Physio she is. Maxine is knowledgeable, friendly but genuinely cares too. We consider ourselves so lucky to have her locally and would not hesitate recommend her to anyone." "As the owner of Equilibrium Pilates and Yoga Studio it is reassuring to have the support of such knowledgeable and experienced physiotherapists as Sharon and Maxine. We are so passionate about helping and educating people about making better use of their bodies, it's great to work alongside practitioners who share the same obsession. We feel very lucky to have a relationship where advice and direction about a client is just a phone call away; it means any work we do with mutual clients will always complement the treatment they are receiving from Sharon and her colleagues. We recommend Sharon Morrison and Associates because we firmly believe they are the very best, a view shared by the many Equilibrium clients who have consulted them."